Fireworks erupt as the flags of 15 nations are displayed during the opening ceremony for Invictus Games 2016 at the ESPN Wide World of Sports Complex in Orlando, Fla., May 8, 2016. The 2016 Invictus Games officially kicked off with the ceremony and wounded warriors will compete over the next five days in multiple adaptive sports events. The thudding noise of helicopter blades cut through the air, bright-colored lights sliced through smoke and fans cheered to honor the more than 500 military competitors from 15 nations who gathered at the ESPN Wide World of Sports Complex in Orlando, Fla., May 8 to compete in Invictus Games 2016. SSgt. August O’Neill, representing the Air Force on Team U.S., kicked the events off by accepting the Invictus flag from first lady Michelle Obama and delivering the flag by being hoisted from a helicopter into the opening ceremony. On July 15, 2011, while deployed to Camp Bastion, Afghanistan, O’Neill was shot through both legs while on a mission to rescue a team of Marines under fire and taking casualties. After 3 1/2 years and 20 surgeries, O’Neill made the decision to have his left leg amputated above the knee. In late 2015, he returned to full duty and began training to return to his pararescue team of brothers. SSgt. August O’Neill is hoisted down with the Invictus flag at the opening ceremony for the Invictus Games 2016 in Orlando, Fla., May 8, 2016. The Invictus Games are composed of 15 nations and over 500 military competitors competing in 10 sporting events May 8-12, 2016. Competitors will participate in 10 different sporting events to include: archery, indoor rowing, cycling, powerlifting, track and field, wheelchair basketball and rugby, swimming, and wheelchair tennis. Also in attendance for opening ceremonies were dignitaries such as Britain’s Prince Harry and Air Force Secretary Deborah Lee James. Staff Sgt. 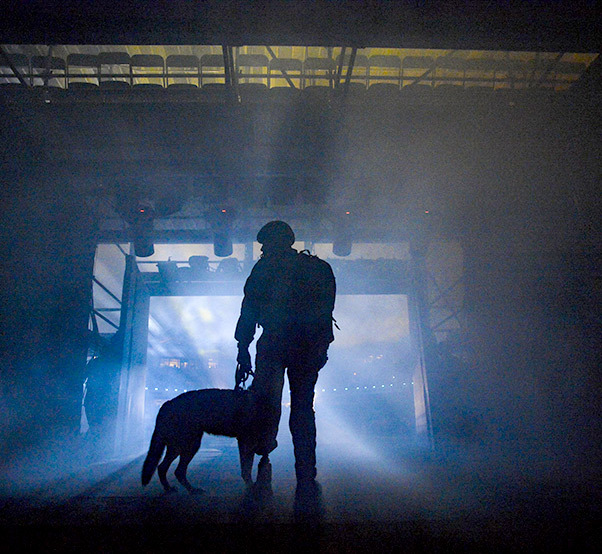 August O’Neill and his service dog, Kai, prepare to enter the stadium at ESPN Wide World of Sports Complex for the Invictus Games 2016 opening ceremony in Orlando, Fla., May 8, 2016. 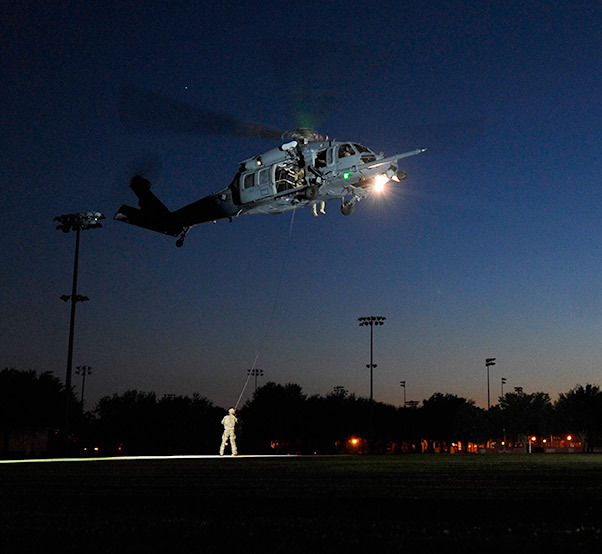 O’Neill delivered the Invictus Games flag after hoisting down from an HH-60G Pave Hawk. 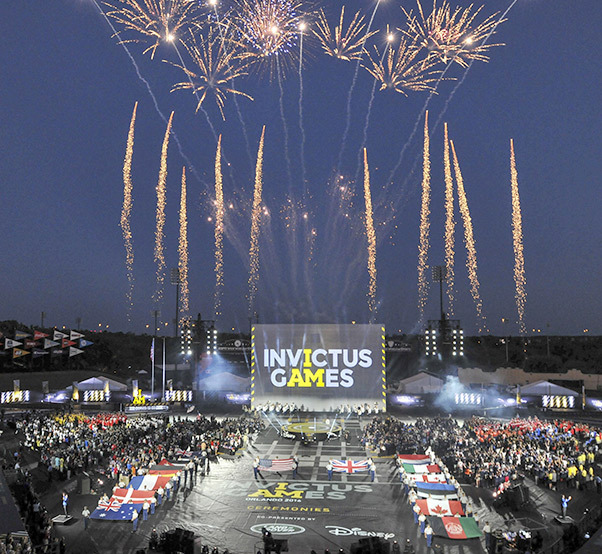 The Invictus Games 2016 will continue from May 8-12. Be sure to check out the competition and follow Team U.S. by visiting www.invictusgames.org. SSgt. 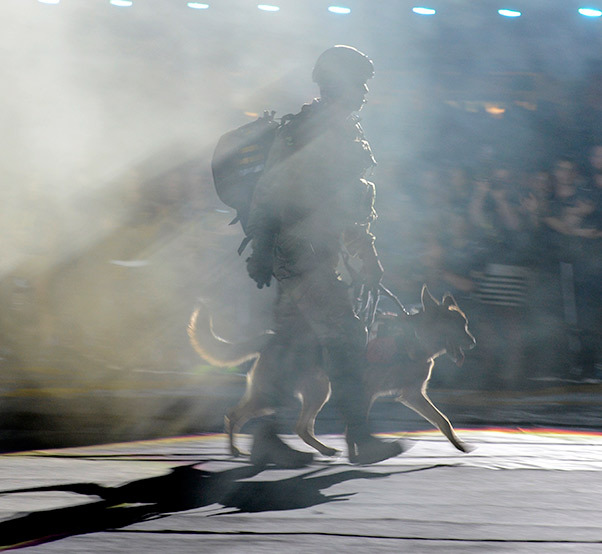 August O’Neill walks in the Invictus flag with his service dog, Kai, at the opening ceremony for the Invictus Games 2016 in Orlando, Fla., May 8, 2016. The Invictus Games are composed of 15 nations over 500 military competitors competing in 10 sporting events May 8-12, 2016. 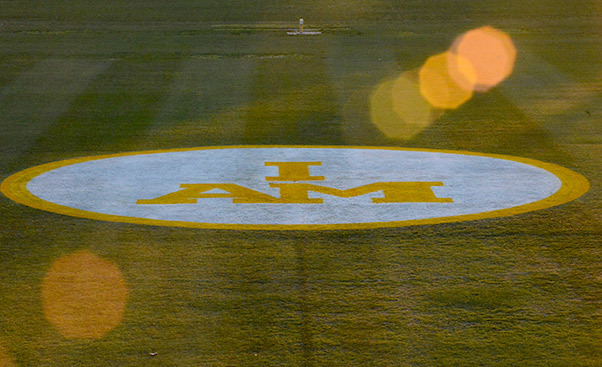 The Invictus Games logo marks the landing zone for the arrival of the Invictus flag at the Invictus Games 2016 opening ceremony in Orlando, Fla., May 8, 2016.